Although you can not search infoUSA directly, it is one of the most important listings a business can obtain. Established businesses that buy yellow page advertising or are listed in business directories will probably already be listed. It does not hurt to submit your listing to be sure they have current, accurate data. Their system will display a link to your current data, if any, and you can expand or correct it using this process. Nice offline promotion tip I never heard about! Thank you for sharing. Could anybody tell if there is some changes in traffic level after submitting your site to the list? infoUSA is not the kind of list you’re thinking of – it is a database that Web sites use and it also feeds devices like smart phones, GPS systems, and handhelds. You most definitely will see traffic from listing with infoUSA, but since that traffic will come from many different sources and not as coming from infoUSA it may not be obvious. There is no easy way to track it – just know that if definitely has an effect. infoUSA is best to have a business link.. surely i vl use this for my all business…thanks for sharing a useful information..
Really helps business owners thanks for the great info. Great post! Info USA is a big resource for those getting in to small home based business. I know they update everything online and it works well for my real estate business! Thanks! infoUSA Database is great way to promote your business. 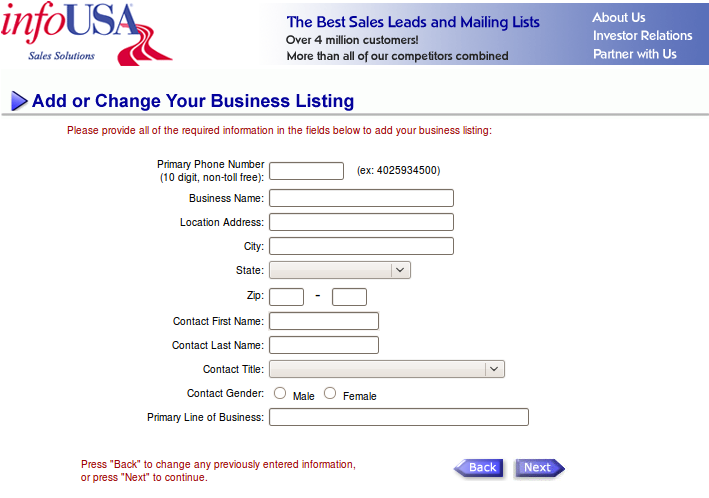 Info USA sounds good to have business listing in USA. Many of people having alot small businesses and to listing in usa business listing is not a easy task to every business i can understand because i also have some small business but the are not listing in usa business directory. Great information i will surely use this for my all business thanks for sharing. Thanks for the suggestion, i was searching for that. If you have another such types of ideas please share it with us. Great suggestion! This is also a free advertisement for your business. Thanks for sharing the idea. This is really the kind of post i am looking for. 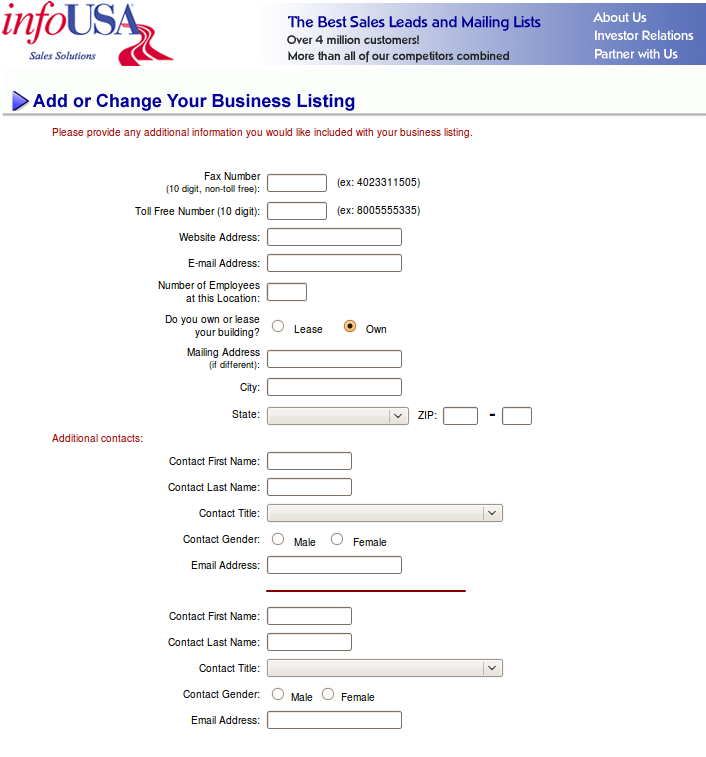 It is easy to understand and really offers a lot of useful information on how to Add the Free Business Listing to infoUSA. Good article. We have recently launched a new Express InfoUSA update service to make it easy for businesses to add, edit or enhance their business records within the infogroup (formerly infoUSA) business database. We have also added bulk file upload and api capabilities for businesses with multiple records/locations. You have a great website. I look forward to promoting this site to my friends. You have put alot of work into this site! Thanks for checking the site! Yeah, I have some interesting stuff saved for the store. I forgot to mention in the business Newsletter, but I’ve got some cool ideas for store features to make it really useful for easy browsing and finding. Yeah, very true, this will also boost up your business among others. your submission tips are up to the mark .i want to try this free listing first than let you the results.thanks for sharing your wisdom.looking forward for more updates. very informative article seems very useful.lets see how it works. Thanks for very useful article. I must try. It’s probably very good and easy method. Thanks for the great write-up! I’m definitely going to make sure I get my business entered into infoUSA as soon as possible. I didn’t realize how easy it really was. Very useful post. Thanks for sharing the information on InfoUSA . .-= Mizanur Rahman´s last blog ..Why Purchasing A New House Todayis So Important!!! =-. Interesting to know that Google, MSN and Yahoo use there service, Im really kinda surprised that each giant doesn’t have their own business listing databases. Great Info will try to get listed. Since I wrote this post I found a much faster way to get into the infoUSA database plus 76+ (and probably hundreds) of other directories. You can read about it in the CommentLuv featured post in this reply. Actually that would be Ms. Strategist but that isn’t obvious and most assume Internet Strategist is male. I am not clear whether the site you refer to in your comment is this one or infoUSA. Yes, you can list businesses that have physical addresses in countries they cover at infoUSA and in other local search directories. This includes online businesses as long as they have a physical address and phone number. You can read about other Local Search sites and a fast way to get listings in the post featured in this reply. Those willing to contribute to the discussions here can also get value from commenting because their site links are dofollow (see DoFollow Tools and Lists) and they can select their own anchor text using KeywordLuv as you have done in your comment. Thanks for info about infoUSA. Anyway I’m from Brazil, you have one alternative? Once I cover all the major directories available here I will do some research on International directories. In the meantime I would definitely check out the major directories such as Google Maps and Yahoo! Local because they are likely to already cover most countries. If you come across any that have listings for Brazil do let me know. Also if you find something and could use some assistance figuring it out I would be happy to assist. I think you will see more and more companies trying to expand their reach onto the internet in the future as more people use this method of search to find what they are looking for. That coupled with the fact that it is cheaper then more traditional adverting alternatives. Yes, more businesses are starting to realize the importance of being easy to find online. I am still amazed that so few take advantage of these free advertising opportunities. Submitting to your business to these directories if very important if you want your business to get proper exposure online. You’re right and that is why we’ll be adding more of these how-to posts. We are also developing a tracking system that we will share with our readers. This is something you should just get over with. It’s not like they’ll add it right away (couple months is nothing unusual here) but once it gets added it’s always a small boost for your website. .-= Maria@Paznokcie´s last blog ..Pazurki od Eweliny =-. Yes, it is best to just add it right away and hope it works since there really isn’t any way to determine whether you are listed there. Their database is not online; it feeds other databases and directories. Do you know if you have to have a brick and mortar store? Or can it be e-commerce only that is based in a specific area? You have to have a physical address you can use. I have never seen any requirement that you operate from a store or sell locally only. I strongly encourage every online business to be listed in this and all the other Local Search Directories. You may want to Subscribe to our RSS or Subscribe via email because I am working on a template for tracking these listings for any business. I will be providing it free of charge through my blog here. I hope you found some useful content here. You can check out the categories to get a good idea what is here. It’s really informative post about inclusion in infousa.com; I think steps you described for listing is quite enough for getting successful listing. Thanks for sharing it. This is one in a series of Local Search directory how-tos. You may want to Subscribe to our RSS or Subscribe via email so you won’t miss any of the others. 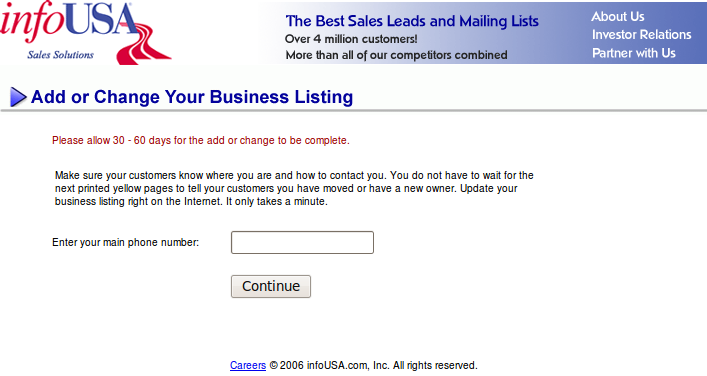 This is a great way to get listed in the most popular directories, search engines, and navigation units. If you have a physical location for your business, you really have every interest in doing this. You want potential customers to find you, so make it easy for them. Absolutely right, Michael. It just makes sense to be as easy to locate as possible – especially if anyone comes to your physical location to do business with you. Even businesses that operate entirely online can benefit though so anyone who has a physical address they can use should add themselves to infoUSA. It’s always one more backlink to boost your pagerank. Also since it’s so easy to do I don’t see why you wouldn’t want to do it. I suspect many businesses are not aware of infoUSA. That is one reason I added this post now. As someone else mentioned it can take a couple of months for the data to be updated so it is good to get this one done early. Many foreign commenters won’t see the benefit as its mainly for Local Search (physical address is needed in most cases). It really does take about two months for your new data to filter through their system and then appear on their subscriber’s pages. Another advantage to having the correct information at Info USA: the cloned listings you will receive from any new “Startup” local business search sites that use their database information. Thank you Matt. Very good point about requiring a physical address. I will edit the post to include it. As we both know, incoming links are the best way to continually grow a business. I submit listings for ALL businesses I assist – even those that sell online only. I will do further research to see if non-U.S. addresses can be added to infoUSA. I suspect not but need to verify. Nice guidelines to make effective work with informative services. Understanding the “big picture” before undertaking a new project is very useful to me. I keep notes and find turning them into posts is an effective way to keep the information at my fingertips and also share it with others. Many of the points I make and strategies used are not apparent until I have listed numerous businesses in each directory so most business owners would not find out about them on their own. I hope you’ll Subscribe to our RSS or Subscribe via email as I am currently working on many more similar posts. . Thanks for info about infoUSA. I doubt submitting to be listed is helpful, but there is nothing to lose, right. Manop’s last blog post..EXIF Info : What you should know about it? You never know where your next visitor is coming from – or more importantly – where media coverage may find you. The more comprehensive your listings the better. Although this is definitely most important for businesses someone would visit locally being in this database is an easy way to generate more incoming links which are valuable for search engine rankings and provide greater visibility.